Democratic campaign promises of Medicare for All are resonating with some American voters who cite the rising cost of health care as a top issue in the upcoming U.S. midterm elections. New York congressional candidate Alexandria Ocasio-Cortez participates in a a town hall held in support of Kerri Evelyn Harris, Democratic candidate for U.S. Senate in Delaware, Aug. 31, 2018, at the University of Delaware in Newark, Del. 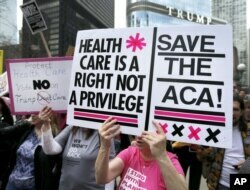 FILE - Protesters gather across the Chicago River from Trump Tower to rally against the repeal of the Affordable Care Act, March 24, 2017, in Chicago. Republicans are on the defensive after failing to repeal the Affordable Care Act, also known as Obamacare, which was enacted in 2010. Many are now claiming to support tenets of the ACA legislation that require insurance companies to provide coverage to patients with pre-existing conditions. U.S. President Donald Trump talks to journalists at the Oval Office of the White House after the American Health Care Act was pulled before a vote in Washington, March 24, 2017.